On the offensive side of the ball, this position might be the most unpredictable. There is talent here, no question about it, but health (of the older receivers) and inexperience (of the younger receivers) make this position a tough one to gauge at this point. Offseason additions include veterans Torry Holt and old friend David Patten, and rookie Taylor Price. Going into camp, the Patriots have 13 receivers listed on the roster, though two of them are on the Reserve/Military list. Does Randy Moss Have Another Big Year In Him? Made some noise this offseason by changing agents prior to entering what is the final year on his contract. He played in all 16 games last season, the third straight season he’s done so. Put up his usual strong numbers (1262 receiving yards, 13 TD’s) and took the usual shots from the media for perceived lack of effort. Following the season it was revealed that he had been battling several injuries over the course of the season. Most experts believe he is heading downhill, while some say that a contract year will bring out the best in Moss. With the team still trying to develop a number of young wide receivers, they need another big year from Moss. Whether he returns to the Patriots in ’11 is in doubt, but he did end up hiring and agent who has gotten several deals done with the Patriots. Welker’s knee injury and recovery from surgery have been one of the best stories of the offseason. Originally it appeared that Welker might be lost for most, if not all of the ’10 season, but recent reports have him being read to go for training camp with the idea of playing right from opening day. Welker has been Tom Brady’s favorite target from the moment he got here. He’s the guy the QB looks to most often. If Welker indeed can play on opening day, it will be huge boost for this offense. You saw what the offense minus Welker looked like in the first Jets game last season as well as the Wild Card playoff game. Without Welker sliding underneath, Brady was impacted by the aggressive pass rush of the defense. With 123 receptions in 14 games, it could be argued that perhaps Brady is too reliant on Walker. Having Welker from the start also bumps down everyone else on the depth chart. A pleasant surprise as a rookie, Edelman made the conversion from college quarterback to NFL receiver seamlessly. When Welker was out, Edelman was thrust into the #2 receiver role, and didn’t embarrass himself. He is described by many as a Welker clone, but he’s bigger and more physical than Welker. His 2nd year development is very important especially if Welker is limited in the early going. He even had two touchdowns in the Wild Card playoff game, one of few Patriots not to completely lay an egg in that one. When injuries struck last season, the Patriots were too often forced to turn to the likes of Sam Aiken to line up as a receiver. Holt is the consummate professional, and while he’s not what he once was, he still caught 51 balls for 772 last season for the Jaguars. When the Patriots signed him, some reporters were unable to say “Torry Holt” without “Joey Galloway” also being in the same sentence. The biggest difference is that while Galloway has never been a strong route runner, Holt is. He can still catch the ball, and as long as the Patriots don’t need too much from him, he can be a valuable contributor, and still provide insurance in case of injury. His professionalism should also be asset in dealing with the younger receivers on the roster. Oozing talent and physical gifts, Tate worked hard to return from a college knee injury, got himself activated for the Tampa Bay game in London, only to get injured again the following week against the Dolphins, and miss the rest of the season. If he can be healthy, and offseason reports indicate that he is, Tate is a young player who could have a big role this season as an outside receiver, stretching the field, and on kickoff returns. Tate is one of many first or second year players that is being counted on to step up and become part of the core of the next group of Patriots teams. I look at the rookie from Ohio University and think “David Givens.” The 2010 draftee is the same size as Givens was, and looks to be the same style of receiver as well. How he adjusts to the pro game is worth watching, as the college system he played in was not exactly a pro-style offense. He looked good and impressed onlookers in the spring camps, and I’m eager to see him in the preseason. He should get a chance to contribute this season. I’m really, really hoping Patten has a chance to make the team, but the reports that Welker might be ready to start the season might’ve sealed Patten’s fate. I had figured that Welker might be placed on the PUP list, giving Patten a few weeks on the roster to start the season. If there is an injury in the preseason, Patten might have a chance, but otherwise I see him on the outside looking in right now. The former Patriot did not play at all in 2009 after being a training camp cut by the Cleveland Browns. Patten will turn 36 during camp, and while he still has plenty of savvy veteran guile, he’s not the player he was earlier in the decade, when he became the first player in Patriots history to record a touchdown pass, touchdown reception and rush for a touchdown in one game. 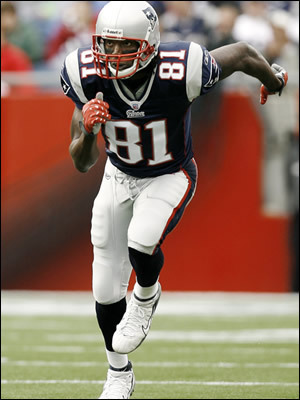 One of the downfalls of the 2009 Patriots offense was that at too many key moments they had Aiken on the field as a wide receiver. Aiken made a few nice catches, but missed out on far too many others. He’s best utilized at the special teams role he was signed for. Another special teams only guy, Slater should also only see the field as a receiver in a blowout. He’s got some value as a kick returner, but not much as a receiver. The Miami product has spent time on the practice squads of the Texans and Browns before being signed to the Patriots practice last season. A long shot at best. Farnham was an invitee to rookie camp following his career at Brown. He impressed enough to earn a contract and an invite to training camp. Farnham has some potential as a punt returner, and could stick around as a special teams player. He seems more likely to be a practice squad candidate. Tyree Barnes, Shun White – these two are on the Reserve/Military List after being signed as undrafted free agents in 2009. They are both on active duty in the Navy. If Moss and Welker can be healthy, they’re still the best 1-2 receiving combo in the league. Edelman and Holt figure to be big contributors as well, with Tate and Price learning the position and contributing here and there. This has the potential to be a very strong positional group on the roster, but like many others, there are a number of “ifs” and unknowns in play here. Having Welker to start the season would be huge. Spot on assessment, though my personal opinion thinks that Holt will be a Galloway clone. Old players in the NFL just can’t impact a game (unlike the NBA and MLB). You’ll see him and Crumpler on the scrap heat before mid season. I guess I have higher hopes for Holt because he’s not a one-dimensional burner like Galloway was. He actually knows how to run a route, and has much better hands than Galloway ever had. He’s also five years younger than Galloway.